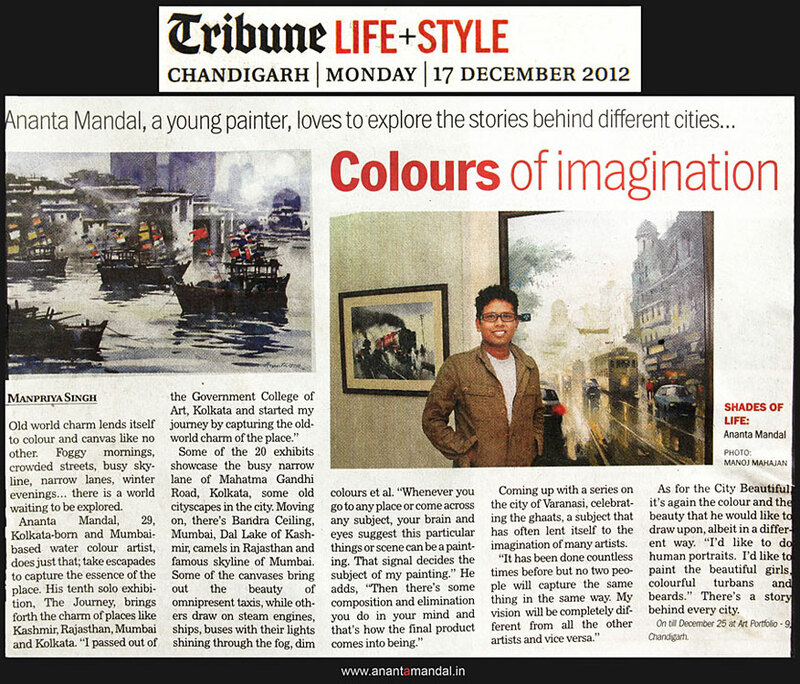 Ananta Mandal, a young painter, loves to explore the stories behind different cities. Old world charm lends itself to color and canvas like no other. Foggy mornings, crowded streets, busy skyline, narrow lanes, winter evenings..there is a world waiting to be explored. Some of the 20 exhibits showcase of busy narrow lane of Mahatma Gandhi Road, Kolkata some old cityscapes in the city. Moving on, there’s Bandra Ceiling, Mumbai, Dal lake of Kashmir, camels in Rajasthan and famous skyline of Mumbai. Some of the canvases bring out the beauty of omnipresent taxis, while others draw on steam engines ships, buses with their lights shinning through trhe fog, dim colors. “whenever you go to any place or come across any subject, your brain and eyes suggest this particular things or scene can be a painting. That signal decides the subjects of my painting.” He adds, “then there’s some composition and elimination you do in your mind and that’s how the final products comes into being”. Coming up with a series on the city of Varanasi, celebrating the ghats, a subject that has often lent itself to the imagination of many artists. As for the city beautiful, it’s again the color and the beauty that he would like to draw upon, albeit in a different way. “I’d like to to human portraits. I’d like to paint the beautiful girls, colorful turbans and beards.” There’s a story behind every city.